Thread: 135G tank is uneven on the stand.. How do i fix this so it doesnt crack ? Question for you guys, 2 years ago i purchased a 34 year old 135g tank from its original owner who bought it in 1984, it was built in 1982 so i guess it sat in a store for 2 years. Anyway, i res-sealed the inside of the tank the seems where the glass meets were all fine just the inside needed redone. The stand for it he had custom made he said and its a steel stand, very very thick it 3/16 thick steel which is thicker then pickup truck frames, and its C channle so pretty strong. The only problem is the stand and tank on 2 corners seem uneven. When i first got it i noticed this before i even filled it with sand water ect.. Basically on the front left corner there is a gap as you can see in the picture and it isnt even touching the stand on quite a large area. The gap isnt very THICK but its still there. Then the other one is on the rear right. Since they are front left and rear right it makes me wonder if the stand is twisted. I wasnt sure how to fix this and i read using any kind of foam or padding on rimmed tanks is a no no, So what i did was shim the two corner with very thin peices of steel. 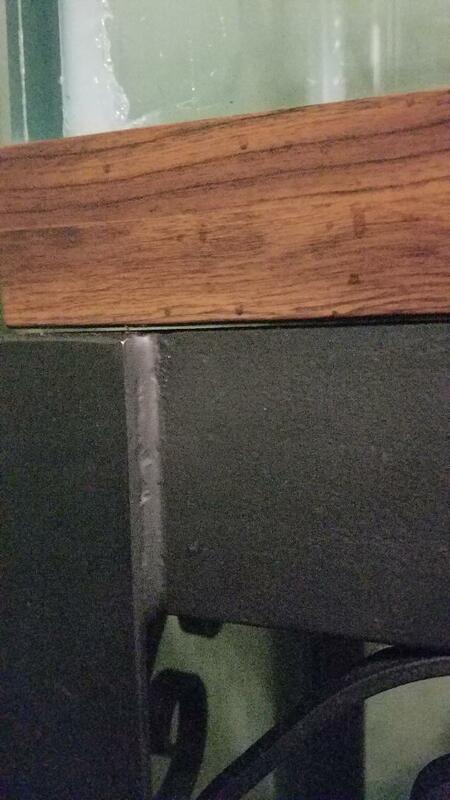 The gaps are large enough to fit a credit card under so thats about the thickness i used. I didnt fill the entire lengths of the gaps you see in the pics. Just shimmed the very corners. I figure this was the best way to prevent the tank from cracking.. As long as the corners dont flex down and the most of the middle of the tank is sitting flush the tank shouldnt flex down from the weight of the water and cause pressure points. 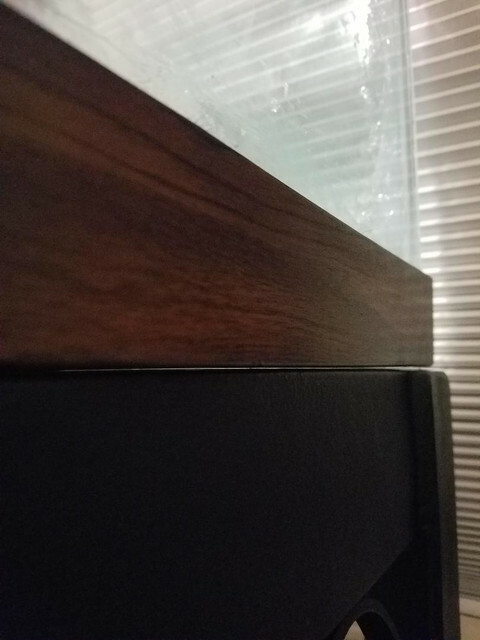 If nothing was filling the gaps on the corners the water weight would push the tank down to try and mold to the twisted stand and could put pressure on the glass in the center. Am i making sense here ? With thin metal shims supporting the two corners i think i eliminated that problem so when the tank is full it wont "twist" itself to mold to the stand and instead the two corners are sitting on the shims with no way to flex. If it's the stand, could you take it to a fabricator and ask them for ideas on how to get it straight? Even if it just means getting them to add another thin layer to the top of it. My thought with shims is that you'd want to shim it all the way along, so that you don't create a bridge.